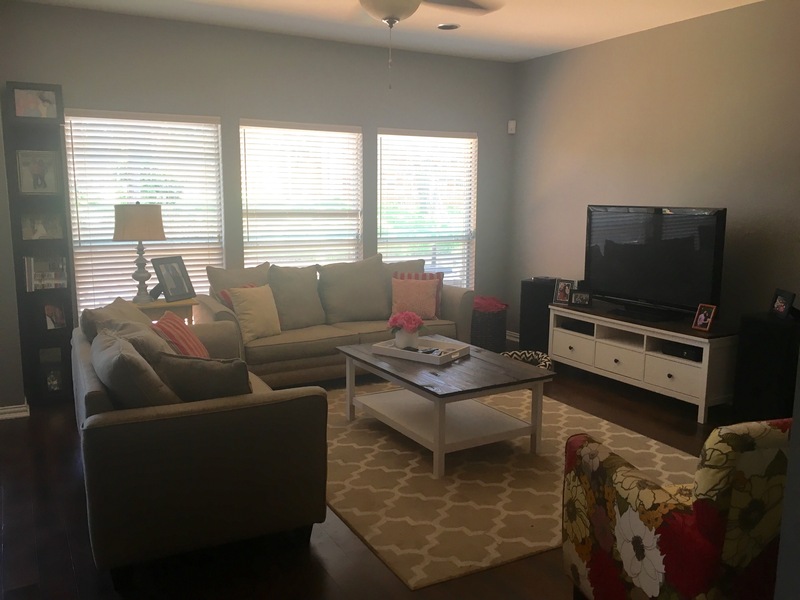 This is the first week, and we are focusing on living rooms! If you don’t blog, you can post your pictures on instagram using the hashtag #everydayreallifelivingroom ! I am so excited about this home tour series because I LOVE looking at other people’s homes! My husband and I purchased this house two months after we got married and have lived in it for a little over a year. We technically have a “living room” and a “den”, so I’m going to blog about both of those today! I call our “living room” the room in the front of the house that we actually never use. Our “den” is the room where we actually hang out and watch TV! OK, here we go! Our living room is in the front of the house. We literally never use this room, but I still love how cute it is! ((Ignore the dog crates!)) The white chairs are from IKEA (I painted the legs blue to match the piano). 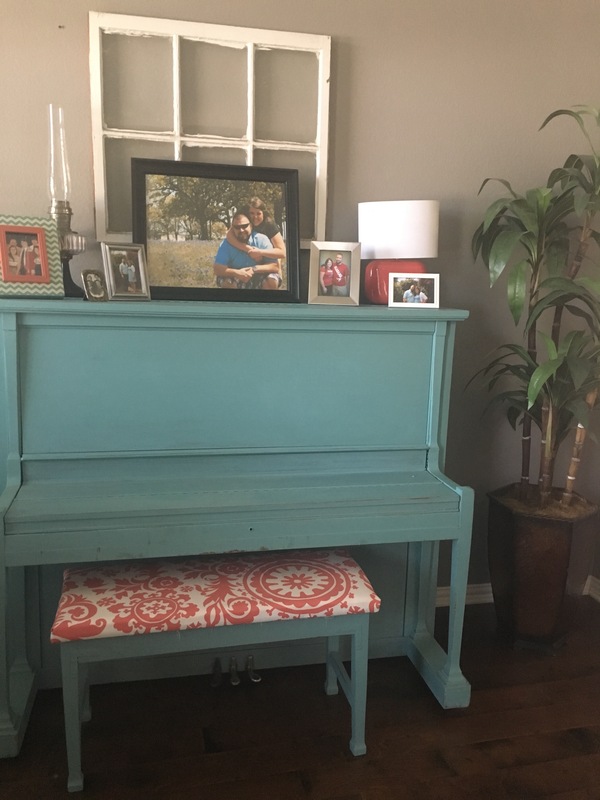 The piano has been in my family for almost 100 years, and yes, I painted it blue! I love the pop of color it brings. The husband says it was a pain to move though, and if we ever sale this house the piano must go with it. HA! 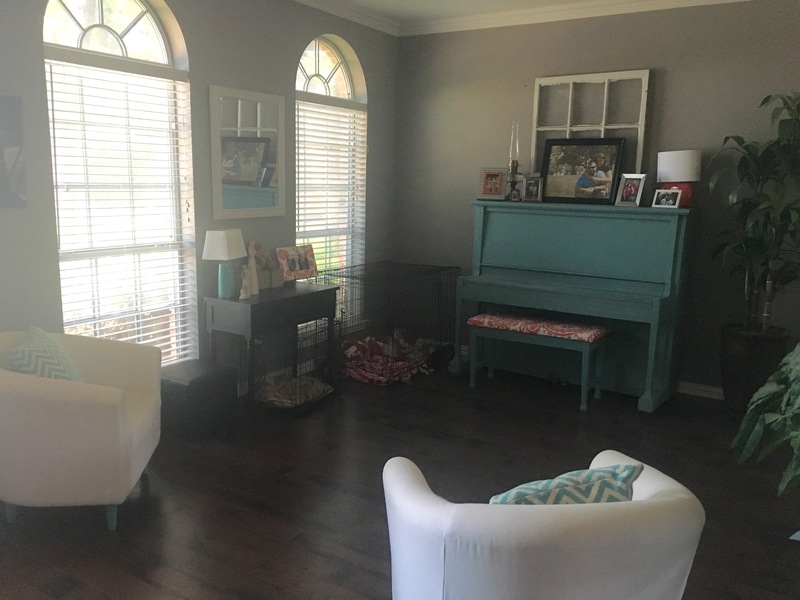 Now on to the den- we are constantly working on updating the home, and I’m no where near happy with my den. 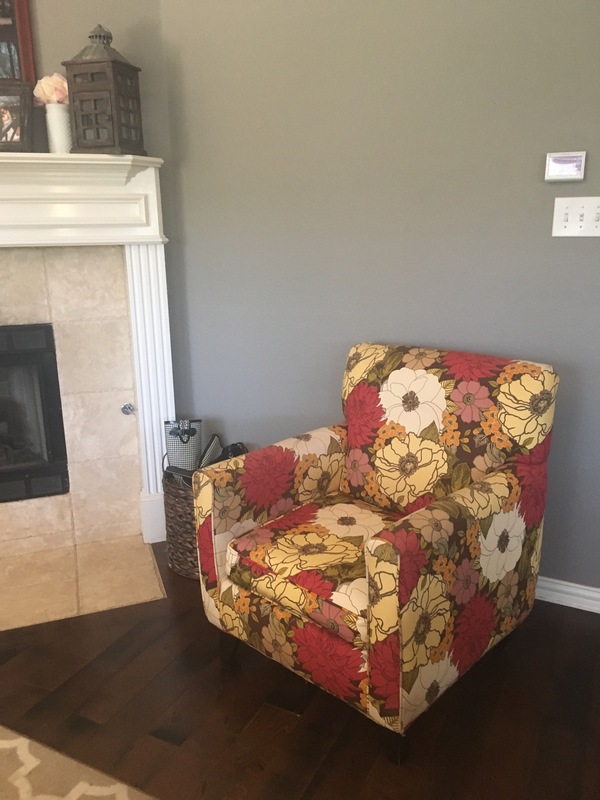 I am dying to buy new couches and chairs for this room, but that’s pretty far down on our “to-purchase” list, so I’m trying to make do with what I have! I love the big windows in our den. I am still contemplating rather or not I want to buy curtains for the windows though. I think I want to buy white ones to put on each end. What do you think? 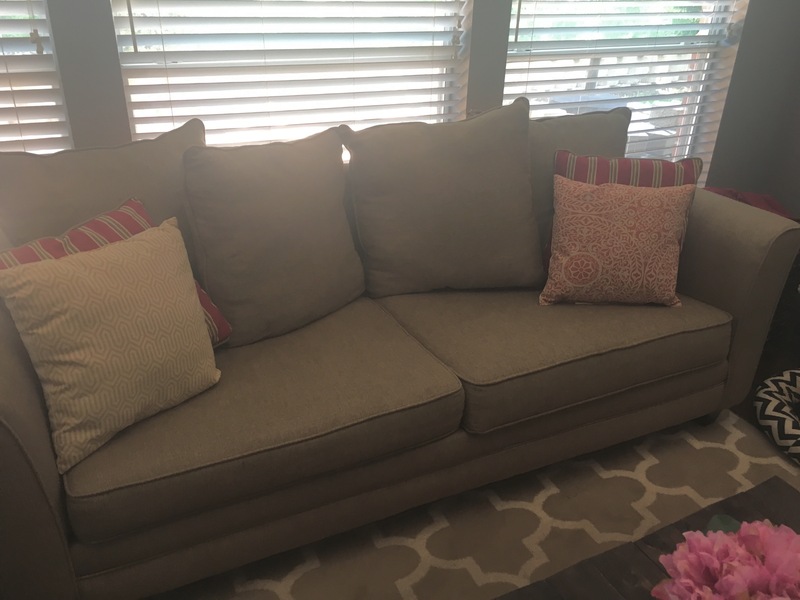 The big pillows on our couches have the same flower pattern as the chair, but I’m honestly so over that flower pattern! So for now I have the pillows flipped around so they are just blank. I did buy some new throw pillows to add some color, but then my husband’s dog chewed two of them to pieces. Sigh. 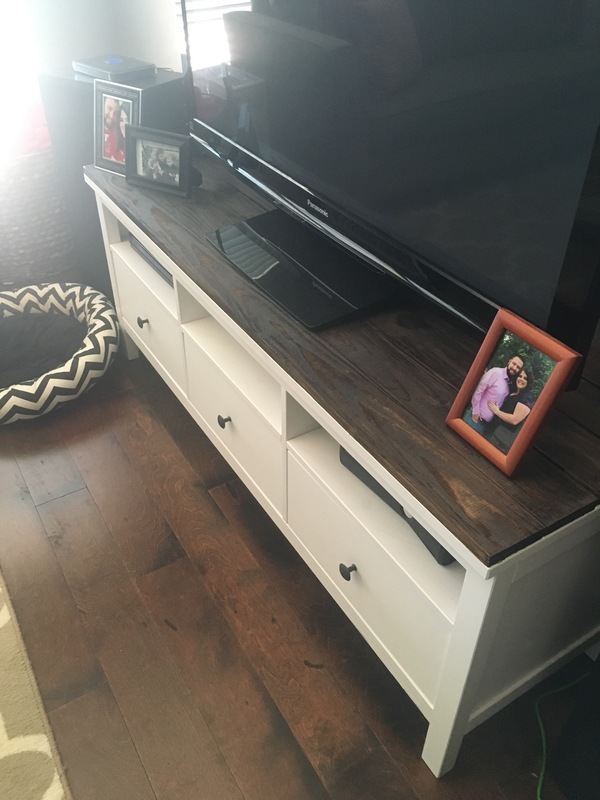 My husband and I did an IKEA hack on the coffee table and TV stand. 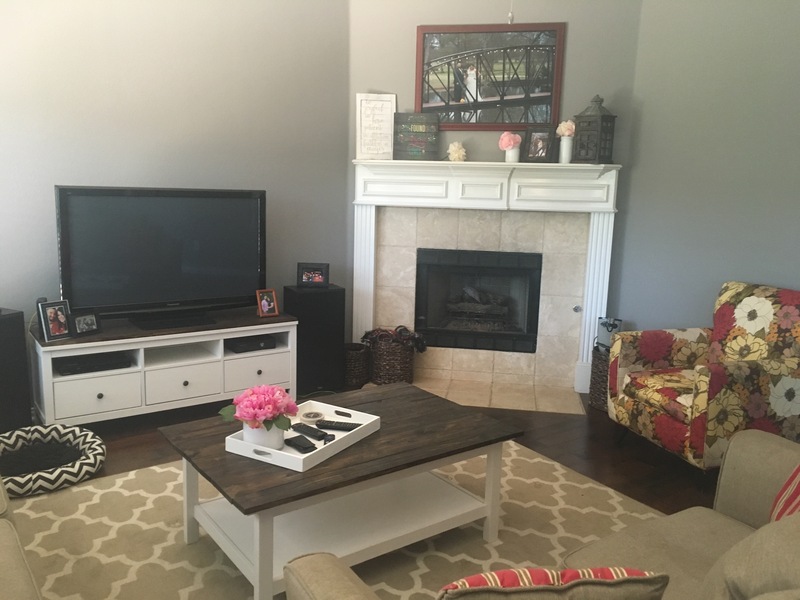 I knew I wanted a white table with a wooden top and a matching TV stand, but we couldn’t find exactly what I wanted anywhere. I looked on Pinterest and followed this tutorial. 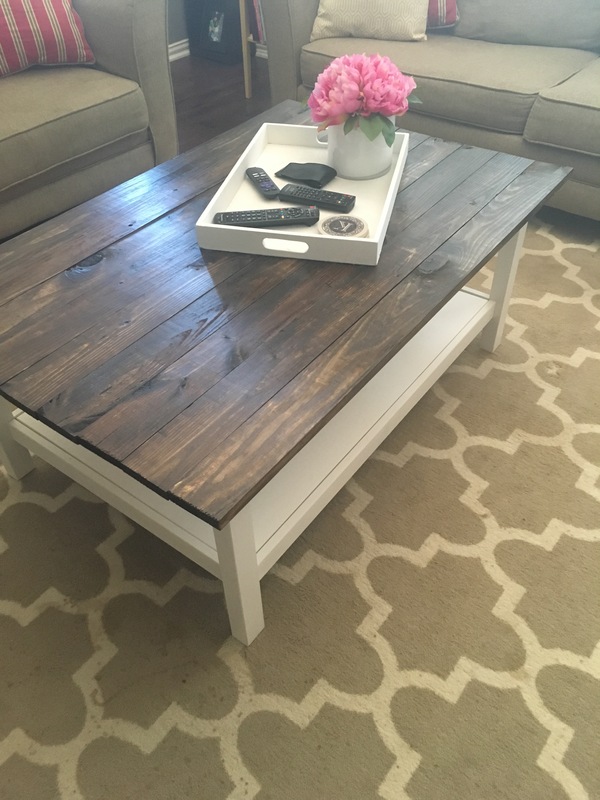 We got the coffee table for $50 off craigslist and the TV stand for $75, so it was a pretty cheap DIY project and I LOVE how they turned out! I have mixed feelings about my mantel. I would love to have a brick fireplace with a wooden beam for the mantel, but for now this is what I have and I try to make do! The white shutter on the left side was painted by my cousin, Chloe. She is SO talented! 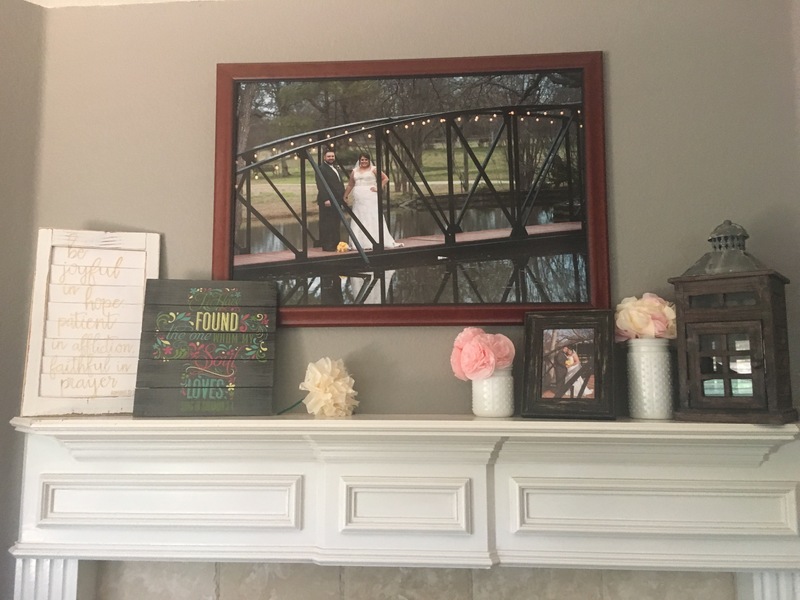 We printed that huge wedding picture and mod podged it on to a canvas, then put it inside the frame. It was a cheap way to get a huge photo! I am considering painting the frame white, but just haven’t gotten around to it yet. The flowers in the vase are actually tissue paper flowers that I made for a wedding shower but wasn’t ready to throw out yet! So there’s the tour of our living room and den! They aren’t my favorite rooms in my house, but I do love them still. I’ll see you next Friday when we tour dining rooms!